When I spot the first fresh peas and broad beans at the market I’m in there like a shot. I find podding peas quite therapeutic and it’s hard to resist popping the delicious raw sweet peas into your mouth and so I’ve usually eaten half of them by the time I’ve finished. Broad beans are just as delicious and I feel it’s worth the effort of double podding broad beans to reveal the glossy and tender beans within. Along with some beautiful baby courgettes and asparagus I decide to let my wonderful ingredients speak for themselves and cook a simple pasta dish with lots of herbs. Why complicate things when you don’t have to! Unfortunately I don’t have the space in my tiny kitchen for a pasta machine so I try to buy good quality pasta that is hand made and has a bright yellow egg colour. You will notice the difference in texture and it will be incredibly light and melt in the mouth. Once you’ve prepared all the elements for this dish it’s very quick to cook so get the table set and white wine chilled. Remember when you’re happily podding away, make sure you save some peas for the meal! The key to this dish is to get everything ready before you start cooking. Pod the peas and broad beans, snap the woody ends off the asparagus and cut in half. Blanch the peas and asparagus in salted boiling water for 2 minutes and then blanch the broad beans separately for the same amount of time. It will be much easier to remove each broad bean from its skin if you don’t have to fish them out from amongst the other vegetables. Drain, refresh under cold water and set aside. Boil the pasta in a large pan of salted water until al a dente. While the pasta is cooking heat up the olive oil in a large saucepan, cut the courgette into thin rounds and cook over a medium heat until lightly golden on one side. Flip over, reduce the heat, then add the chopped garlic and continue cooking for 1 minute. Be careful not to burn the garlic! Add the wine and cook until reduced by half. Drain the pasta and reserve some of the cooking liquid. Add the pasta to the saucepan along with add the crème fraiche, lemon zest, juice, and the parmesan. Add a good splash of cooking liquid to loosen the sauce. Stir everything together and warm through for 2 minutes. Add the peas, beans, asparagus, chopped herbs and some ground pepper. Stir to combine, put a lid over the pan and heat through gently for a further 2 minutes. Test to ensure hot but be careful not to over cook the vegetables as they will turn a nasty grey colour! Serve immediately. 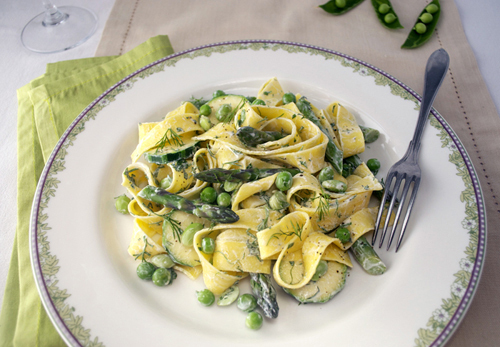 This entry was posted in Vegetarian and tagged asparagus, broad beans, courgette, fresh peas, parpadelle, spring veg, spring vegetable pasta, summer pasta on 25/07/2012 by Val McArthur. I’d love to hear your feedback so let me know how it goes. I’m a part time vegetarian that is always looking for a new recipes. I’ll give this one a try and let you know how it goes! Great photos by the way! 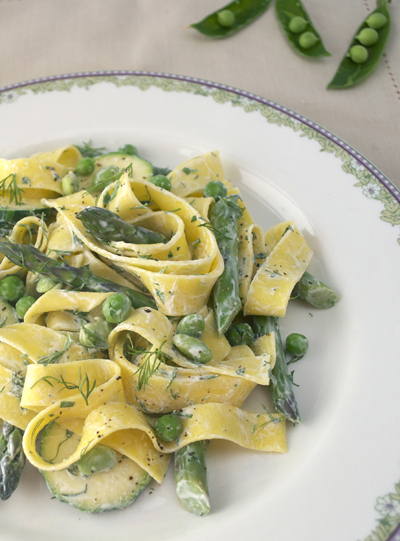 This looks like the PERFECT greens with pasta! Wow.